In some cases, you might realize that you don’t like the default icons of an application, and maybe you wish to change them with something of your own taste. For Android devices, changing desktop icons is actually possible. All you need to do is to use icon replacement apps like LauncherPro, GO Launcher EX, Apex Launcher, Nova Launcher etc. As for the replacement icons, there’s a lot of them available online, but finding the ones best suited for you might not be easy. 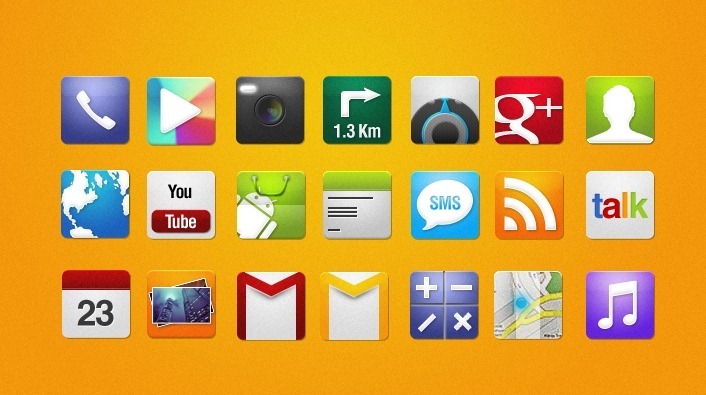 In this post, we share a list of Android icon sets which are of high-quality and good-looking. All of these are free so you can get cool Android menu icons on your phone without spending a dime. If you are a developer or designer, on the other hand, I hope you will find this post to be inspiring. We have collected a lot of Android app icons with designs that might spark your creativity and aesthetic sense. If you find this article helpful, please share it to your friends by clicking the social media buttons. We will also be thrilled to hear feedback from you, please drop us a note in the comment section! This free Android icons set have 75, 125×125 icons in .PNG format. The pack contains 37 icons, with 24 extra alternates. 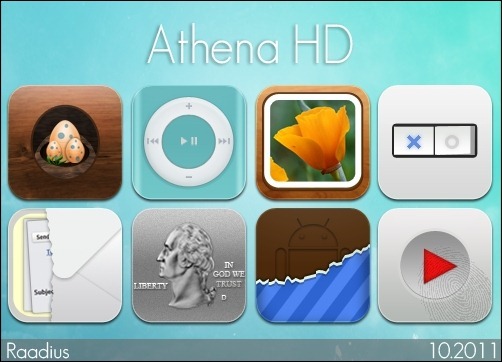 There will be an MIUI theme, ADW (EX) Launcher and Launcher Pro (Plus) theme as well. renewSet icons for Android in 72px consisting of some 46+ icons with original color from Android 2.x/4.x. 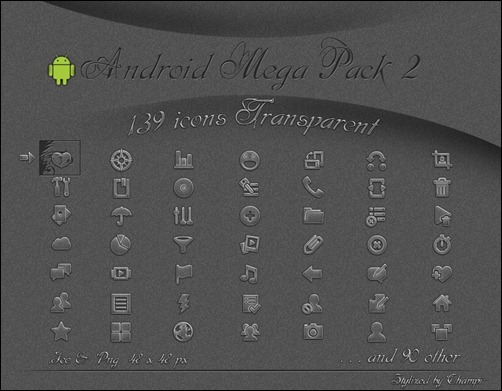 A beautiful transparent Android icons set. An awesome set of different Android icons. 8 Android weather icons in PNG and PSD format. 18 high resolution Android Honeycomb style icons for Windows and Mac (+PNG). Original icons included in package. This is a nice set of Android icons for your applications. Icons for Android in 48×48 pixel size. Small Android icons at 48 pixels x 48 pixels. High-quality green icons for Android. SteelGlass Icon Pack for Android based on the Glasklart Icons. Android Icon pack at 80 pixels x 80 pixels. 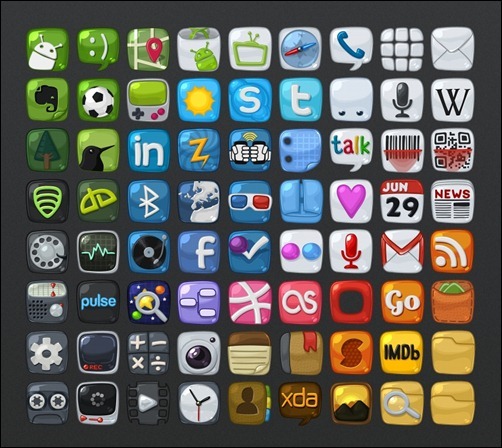 An assortment of icons for Android phones. 15 high resolution Android style icons for Windows and Mac (+PNG). 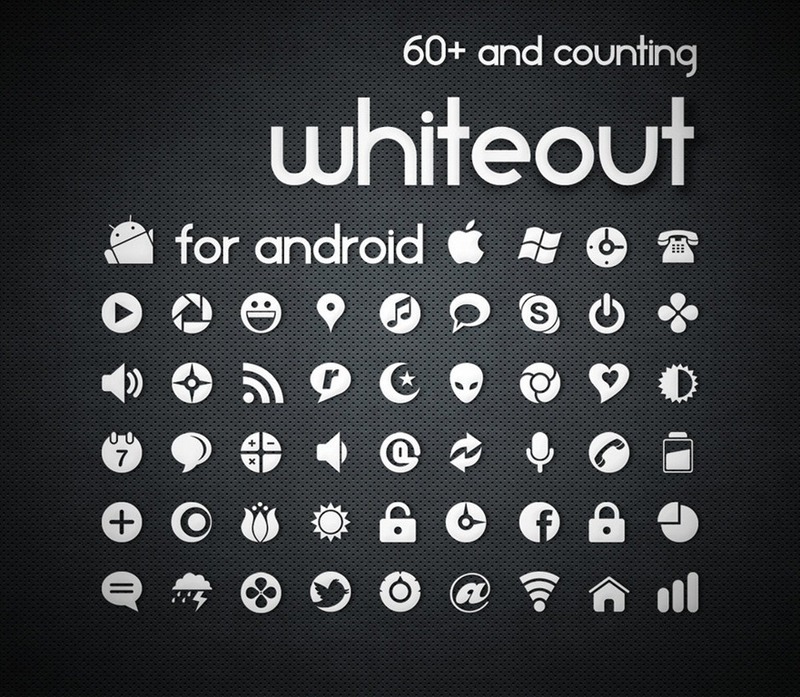 An amazing set of monochrome Android icon set. A mix of iPhone inspired Android icons. 30 icons for apps like: Angry Birds, Layar, Evernote, Settings, Doubletwist, Shazam, Firefox Home, Bookmark, NewsRob, Barcode scanner and more. 72 icons total, in all formats, for all densities. 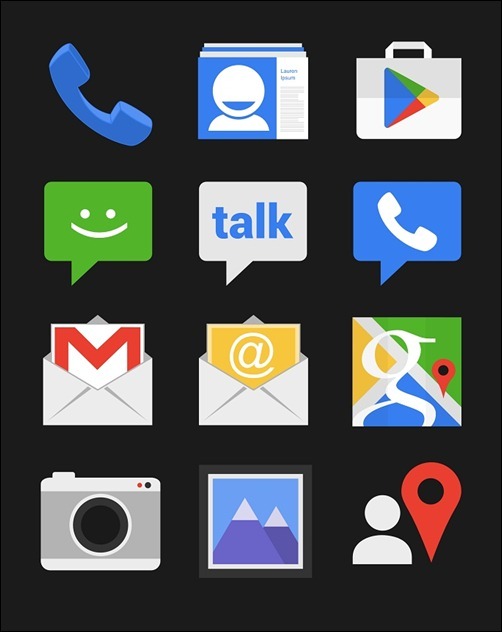 This icon set has some of the default applications on Android phones. There are 26 icons of each version, each 72×72 pixels in size. 708 icons of size 118×120 px. Android HD Icon Pack for different applications. 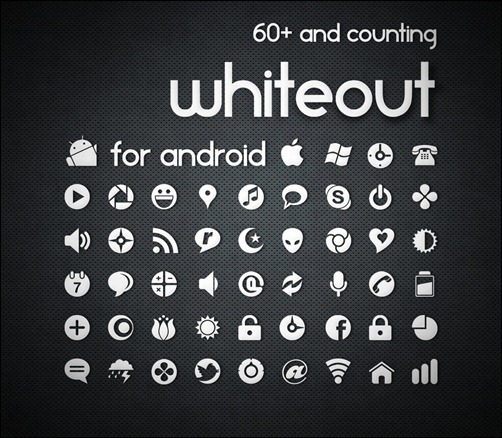 A sizable collection of whiteout icons for Android. Faenza like Icons 96×96 Px PNG. 76 green icon + 74 grey icon in this pack. A nice collection of Android icons for developers. 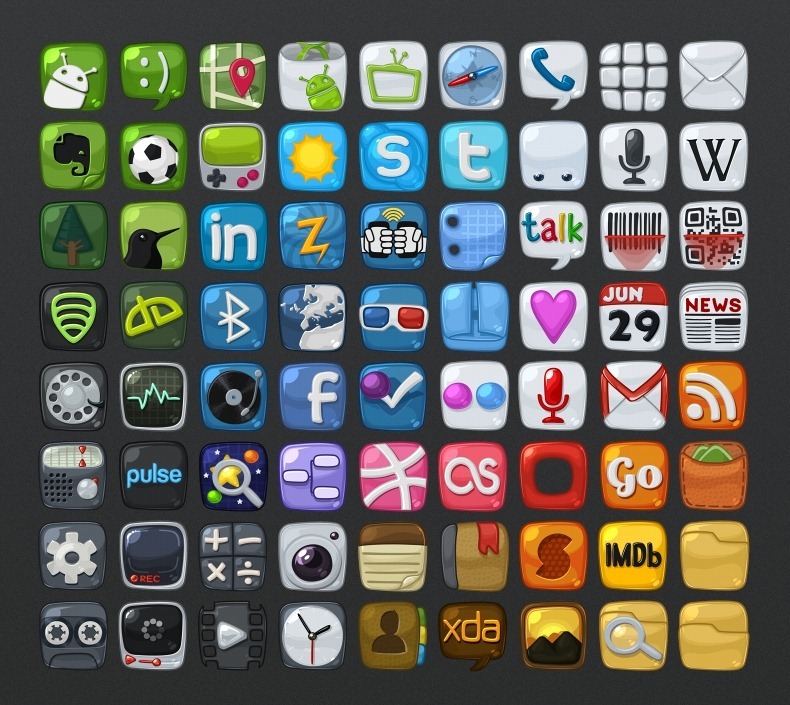 Here are 147 icons, inspired from the stock app launcher in Android 4 ICS. I love changing icons, it’s a great way to make your phone feel unique. I spend so much time on a computer for work, it’s nice to change certain icons around on my personal stuff, just to make it feel like I’m using a gadget for recreation and make it distinct from more professional tools.